First off, feel free to tell us more about the person behind the GM screen. What do you do aside from gaming? Alter Ego’s? I am foremost an aspiring fiction writer. My health keeps me from a lot of regular work, so I spend my days working on my novel(s) and my OP site. I am 50 years old, and hope to finish a couple of my longer novels this year. I am unpublished as of yet, but am hopeful. My stories have appeal to many of my friends, some of whom do not usually enjoy fantasy fiction, which is my primary genre, although I have a couple of steampunk and SF stories either written or in the works. I do a little freelance graphic art, and have used OP as an excuse to learn the software and hone my artistic skills. I also enjoy blues music, and three nights a week I am a blues music DJ in the popular online social game Second Life. I also love to attend Renaissance Faires, blues festivals, and enjoy exploring California with my fiancée Sara, who I introduced to gaming (and she loves it). I am truly a lucky fella. Tell us about Crimson Skies in a nutshell. CS began in a different place that where it is now. It started in concept as Warehouse 13 meets Stargate. A powerful group sends the party through magical portals to exotic places to collect dangerous artifacts. But when a samurai character joined the party (who had kind of botched a couple of previous retrieval missions), the Quest for Kaidan was born. Kaidan is “A Japanese Ghost Story Campaign Setting”, created by Rite Publishing. I am not running their adventures, but have taken the background presented in that world, added it to my world in a far-off island chain, and created an epic quest to break the corrupt ‘wheel of life’ and save the peoples of Kaidan from this terrible curse. The majority of the quest takes place outside of this mysterious, mist-shrouded land. After visiting the Oracle of Meridimnus (akin to Delphi) and receiving the oracle’s prophecy, the heroes now quest for six powerful artifacts, which they will be presenting to a strange mythical asian dragon in exchange for a means of defeating Kaidan’s Undead Emperor and his noble minions. Can you also tell us about Crimson Sands? I see both campaigns seem intertwined in one another, how does it all relate? I have a group of friends (outside my regular gaming group) that wanted to play in an arabian nights style game, fighting oppression and the like. I happen to have such a land in my world, so Crimson Sands was born. As this side-game is set in the same world, I linked the two OP campaign pages together, for ease. The crux of this campaign is as follows: The heroes are based out of a hidden and forgotten ramshackle wizards tower, trying to thwart the occupying Phthyan (Thee-yen) Imperial legionaries (think Romans). Unfortunately, we have not yet been able to actually play. Yep, I am the only DM. I have only ever had a few games with a co DM. I can’t say I am opposed to them, but it is not something I am used to. Your wiki is exquisite, and there’s a TON of custom work here. What are your tools of the trade (photoshop, etc.) and do you do it all yourself, or is it one of your players, a group effort? Thanks, I work pretty hard on my campaign. As for the maps, I start in EazyDraw for mac, then polish things up in Photoshop. Most of the art are found pieces, thanks to the awesome artists at DeviantArt and other sites. I often customize the art to suit the adventure log, if I have time. My players contribute awesome journal entries and occasional art (Iz, one of my players, is an artist). But all in all, for the wiki, its all me (but I certainly do incorporate many 3rd party works and ideas, shamelessly utilizing them, customizing them to fit into my world). In some instances, like Kaidan from Rite Publishing, I am using their maps without much editing, and link back to their web site for wiki info. You’ve got probably the best intro video I’ve seen put together for a campaign so far, there’s clips from dozens of movies/games in there. Who put that all together? Again, that was all my doing. I had done a couple of video edits previously, and really wanted to make something polished for the game. I still want to make more, and have a few ideas, but I am trying to focus my energies on the campaign now, and finishing one of my novels. Speaking of your players, how long have you known them and how long has your group been together? How long has your game been going on and how often do you play? I met AbsyntheDragon a few years back at a NaNoWriMo write-in. We started playing with a small group that just did not gel. A year later we found a second player (Iz), who invited a friend, who invited some friends… now we have six players and they are all a lot of fun. We just finished game session #66 and have been playing this campaign now for a year and a half. We play every Friday night, and sometimes add a weekend game every month or so. Pathfinder is a great system, is there any reason in particular you use it as opposed to other systems? I started playing D&D back in 1977, and have really enjoyed seeing the metamorphosis through the various incarnations. But 4th edition simply did not feel like the game I had played for all those years. Paizo had done such a fantastic job with Pathfinder, that I decided to dedicate the foreseeable future of my gaming to that system. I love other systems too, but for fantasy, Pathfinder is my go-to game (Unless I am playing Ars Magica, another fave of mine). 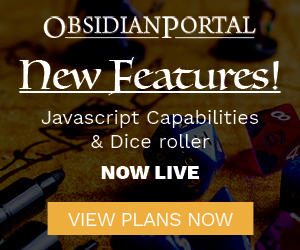 You’ve got a great character sheet setup, are those live/functional XP bars? How do those work!? The character sheets I cannibalized from other sites I have seen, and made them up to suit my needs. The XP bars are nothing automatic. I do the math each week and enter the percentage each time. You can find a template/code for the EXP bar, and how to do the calculations by following the KUDOS link on the CS sidebar. What are some games, movies, books, or other media the influence the Crimson Skies world? Books: Lord of the Rings, Game of Thrones, The Sharing Knife, and anything I may happen to be reading. I ‘borrow’ themes and storylines, character quirks and villainous motivations. I am really into creating a compelling story, and I try to make it come alive. I also watch a lot of TV documentaries, lately about the Romans and Egyptians (including those odd-ball theorist alien-influenced specials). I never know what little pearl of inspiration I might find in there. My world is rooted in history, with the mythic and mystical incorporated into it. So any little tidbit that I find about culture or peoples make it a richer environment. Also, little things can spark ideas for adventure, such as gladiator training schools and noble Roman women who worship them, to the extent of purchasing elixirs containing the gladiator’s sweat to use as an aphrodisiac. Truth. What would you say the single biggest highlight from the game has been so far? the I think we all really enjoyed the session when the heroes finally visited the Oracle of Meridimnus. I modeled the place from the Delphic Oracle. The visit was a long anticipated key step along the path of their quest, and gave them insight on what they need to do in order to save Kaidan (and the world). I even made a silly video with the prophecy, did a voiceover, and mixed it so it sounded less like me. The group spent the rest of the session deciphering the cryptic prophecy. They toiled only a bit, and were quite insightful piecing things together. I was on a storyteller’s high, and I know the group had a blast. Give us some of your best GM’ing pearls of wisdom before we head off. I discovered what I think is a very clever way to deal with sessions when I have absent players. Rather than trying to play the character as an NPC or struggling with bending the story to explain their absence, I invented a little foil, which is a bit cheesy but has come in quite handy. Essentially, all of the characters have a curse, which they to this date have not found a cure for. When a player misses a session, their character turns into a wisp of smoke and is sucked into an accursed magical lamp being carried by a random character (the lamp seems to never stay with the same character, and they can not rid themselves of it). Inside the lamp is a luxurious place, which the party has dubbed “the impossible palace”. The characters when inside, have an excuse to learn new skills and feats, and train for that next level. Also, time passes differently and inconsistently inside the lamp, and often spits them out in some other place and time, at my whim, before returning them to the party. So if I need to give the players some information that there is little chance of them obtaining on their own, they can have a mini adventure inside the lamp (which is usually just described at the beginning of the session the player returns). Bad things can happen as well. For instance, Dorak, our dwarf, has been spat out and captured by Phthyan slavers and spent 15 years digging in coal mines. He is now nearing an age where his stats will be affected. Its all good fun, but there is usually some little negative aspect to missing a session, hence it is really a curse. Check it out in the Crimson Skies wiki. That wraps it up for June guys and gals, keep it tuned right here for more campaigns and more. We’ll see you back for another installment in July! Who will it be?! You tell us, nominate those you deem worthy over in the forums! Congrats PhoenixMark on COTM! Your site is spectacular. Thanks for sharing with the rest of us. The article is awesome and makes me want to get back into fantasy but I have to rage at being lied to. The article titles says Crimson Skies….very different from Crimson Sands!! Very, very well deserved! Keep up the awesome work! Congratulations PhoenixMark, that’s one solid site! Congratulations PhoenixMark! Your site is very creative and well laid out. Love it.